Empower salespeople with insights to personalise relationships, predict customer requirements and increase sales. Get recommendations and guidance at every stage of the deal with built-in intelligence, enabling you to stay focused on the next step to move deals forward. 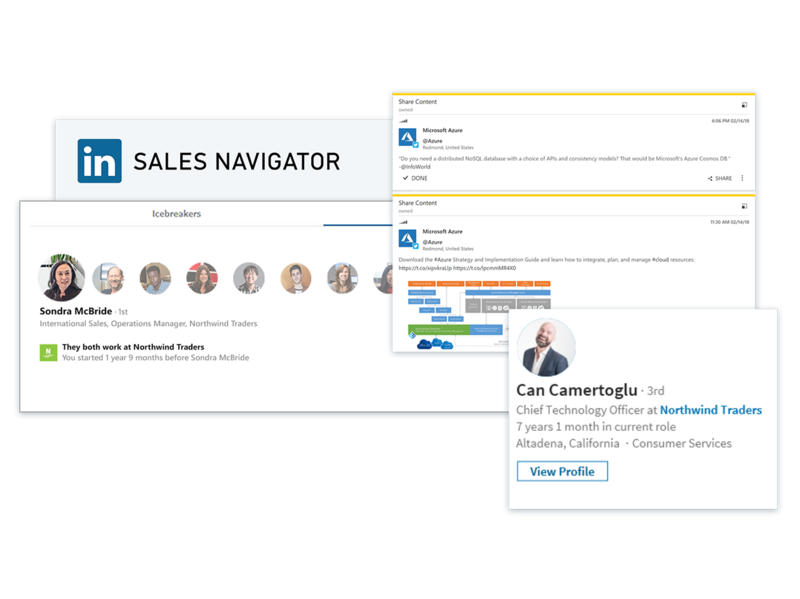 Find and connect with the right potential clients and grow sales relationships by using LinkedIn Sales Navigator with Dynamics 365 for Sales. Seamlessly connect business process data with Microsoft Office 365 and LinkedIn data to guide salespeople through your sales processes to make selling easier—even while on the road. 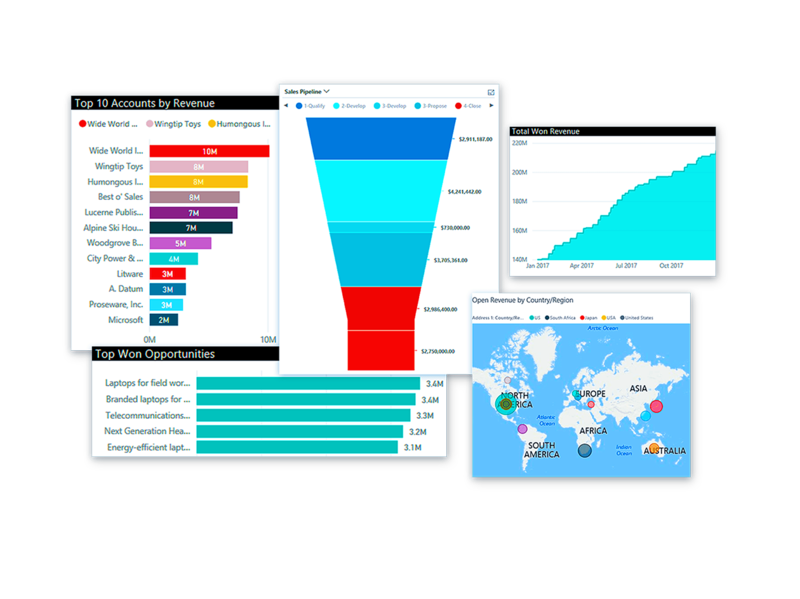 Follow your sales team's performance with analytics dashboards based on historical and predictive data. On-board and motivate salespeople through sales competitions that promote teamwork and accountability. Drive innovation with a sales application that is easy to tailor, extend and connect to other applications and services you already use in your business. Strengthen relationships with personalised and relevant interactions based on embedded intelligence that helps you exceed modern buyers' expectations. Elevate your email communications with embedded intelligence that tells you when and how customers interact with your emails, so you can be proactive and responsive in your communications. See what buyers are really thinking with social intelligence that reveals sentiment and identifies potential competitive threats. Build trust with insights centred on specific customer requirements and easily manage these relationships with integration between LinkedIn and Dynamics 365 for Sales that unifies data and processes. Find opportunities and nurture relationships with embedded intelligence that highlights the relevant conversations to join and recommends content to share. Get suggestions for content based on what you're working on and who you're working with. 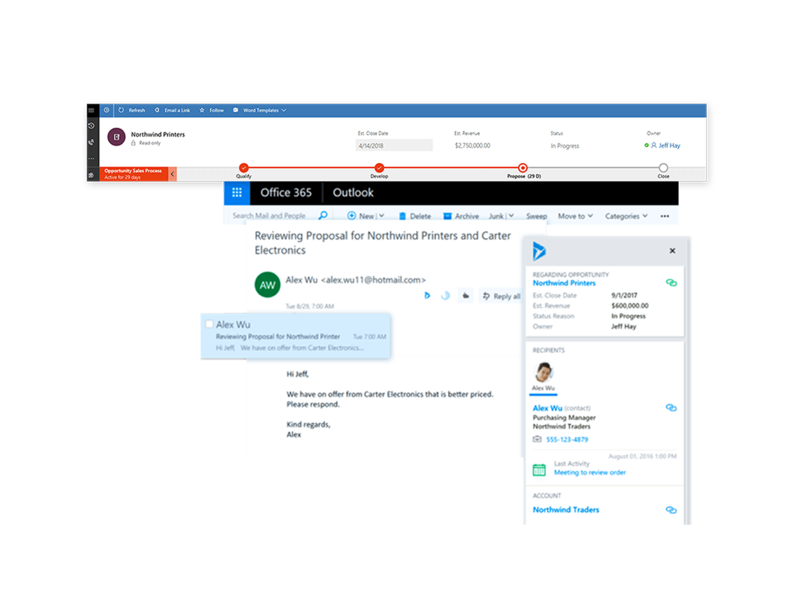 Quickly create personalised documents with familiar Office 365 tools that enable simultaneous collaboration and editing. Accelerate deals with an end-to-end, engaging experience for opportunity management. Use familiar tools like Excel and Outlook for day-to-day sales activities. See the status of cases, all without the hassle of switching applications. Recruit, on-board, and strengthen your partner channel through deeper enablement and activation. 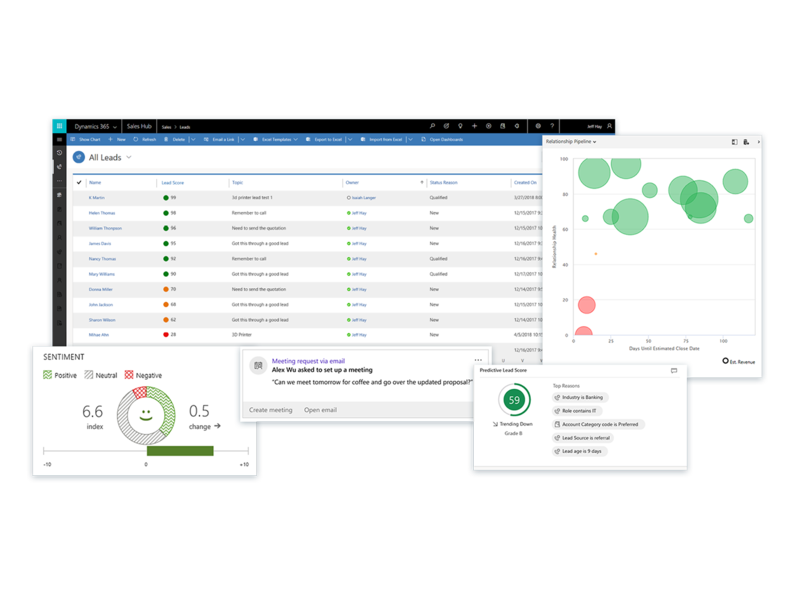 Give partners a quick view of interactions across opportunities, cases, and other relevant information. Ease on-boarding of new sales people. Align sales behaviour with best practices, interactive help and documentation. Meet your numbers by setting goals, monitoring results, and providing feedback and coaching. Investigate deviations from the plan and take corrective action using real-time analytic dashboards. Energise the sales team with fun and exciting sales contests. Improve sales performance and hold everyone accountable with a unique gamification solution that makes results highly visible. Accelerate the time to market and adapt the app to your specific needs with no-code visual editors and tools that make it easy to build and deploy web and mobile applicatons. 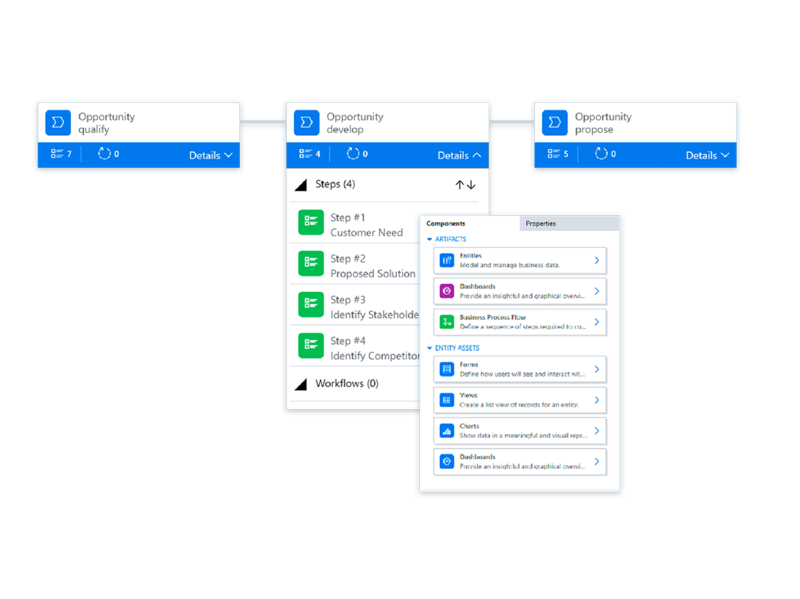 Automate processes across Dynamics 365 applications and third-party systems for a unified experience. Rely on the Microsoft cloud platform to reduce cost and the complexity of operating a global infrastructure. Trust Microsoft's state-of-the-art data centres to safeguard your data. Transform your customer interactions with deep insights provided by embedded intelligence that guides your teams to the right business outcomes. Contact us to discuss your Dynamics 365 for Sales requirements or for further information.